In my briefing with SNIA Europe, during the last Powering the cloud event, was with Bob Plumridge, SNIA Europe Chairman of the Board and Mark Jones Director Technical Marketing of Emulex but present as Vice Chairman of FCIA (Fibre Channel Industry Association). SNIA (Storage Networking Industry Association) Europe advances the interests of the storage industry by driving the evolution and adoption of storage technologies and standards, educating the market and influencing relevant EU and national polices. As a Regional Affiliate of SNIA Worldwide, they represent storage product and solutions manufacturers and the channel community across EMEA. For example, the SMI-S (Storage Management Initiative Specifications) standard, described in the post about the System Center storage integration, was defined by SNIA in the end of 2003. During the meeting we have talk about that hot topic (Hybrid Cloud and Big Data), the market trends (like the converged infrastructures) and the SNIA Community (build also with a lot of end users). But for more information, news and updates about SNIA there is this good video. But we have spend most of the time to talk about FCIA (Fibre Channel Industry Association) and the role of Fibre Channel the current storage and the storage in the future. The history itself of enterprise storage is strictly related to the history of FC: started with the 1 Gbps version is now available the 16 Gbps (Gen5) and the next standard (FC a 32Gbps, Gen6) is planned to be available in 2015 (specification currently under development within ANSI T11). And will be backwards compatible two generations. Somebody could argue that FC is growing in a linear way and Ethernet (standard 802.3 to be more clear) is growing in an exponential way… so in few years it will have more bandwidth rather than FC. But note that both are different time scale, FC is growing each 3-4 years, Ethernet with a bigger time range. And of course bandwidth is not the only aspect to be considered. FC remain (and will remain) interesting in several scenarios and user cases. And 2013 was also an interesting milestone for FC: 11 Million ports shipped (Worldwide Storage Area Network Market – Fibre Channel Forecast, January 2012)! But probably the interesting aspects for the next generation will be the new “port aggregation” configuration and the new option in simple (and fabric free) network topology. In order to aggregate 4 lines a new QSFP cable connector will available, that make this solution similar to the 40 Gbps port in the Ethernet world. This will bring 128GFCp based on 4 lanes of 32GFC; and will be backwards compatible to single lane 32GFC or 16GFC. In a similar way it will also provide the 40Gbps in FCoE networks. 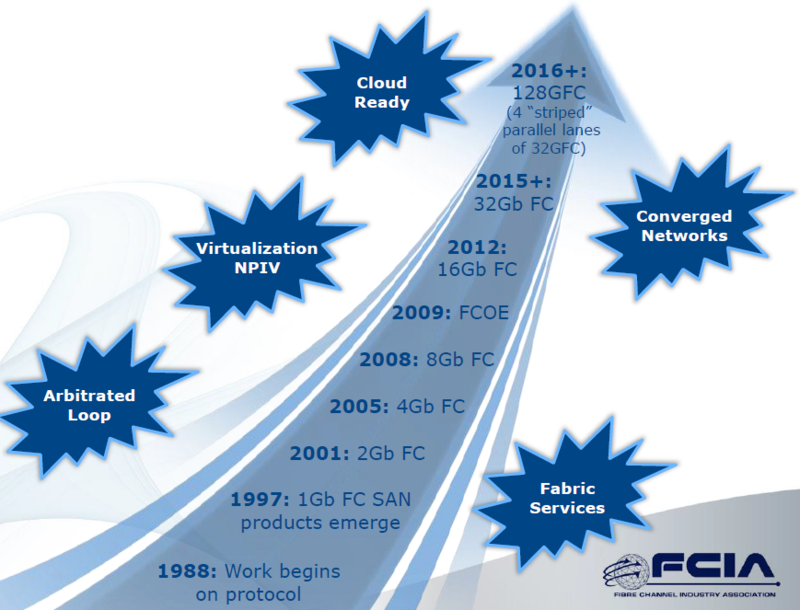 The new “network topology” will be only for FCoE and is called FC-BB-6 and it’s a VN2VN port (Virtual Node to Virtual Node) that does not require any FC fabric (that permit to reduce the cost of FCoE). Each VN2VN port will learns about all others in its VSAN, that means no FC Zoning. Finally we have also talk about the converged infrastructures and the applicability in a real world: basically was confirmed what I’ve seen… Converged solutions are used in blade systems, much less in rack systems (even for a trivial problem of roles distinction and responsibilities between who manage the network and who manage the storage part). This, at least in the short term … Obviously, the network virtualization (with Software Defined Network) and storage (with Software Defined Storage) can bring interesting news and developments. See also: full report list of Powering The Cloud 2013 event.